Hanford has two stunning walled gardens which provide the food for the kitchens throughout the year. Seasonal vegetables from the garden used by the kitchen include potatoes, tomatoes, cavalo nero, salad (all year round), cabbage, leeks, onions, squash and pumpkins. There are always a bowls of fresh fruit available to the girls dotted around the Hall and Garden Hall. The apples, pears and plums come from the orchard in the autumn. The tomatoes and berries, which ripen over the summer holidays, are frozen and stored for the following year to keep us ticking over for the off-season. 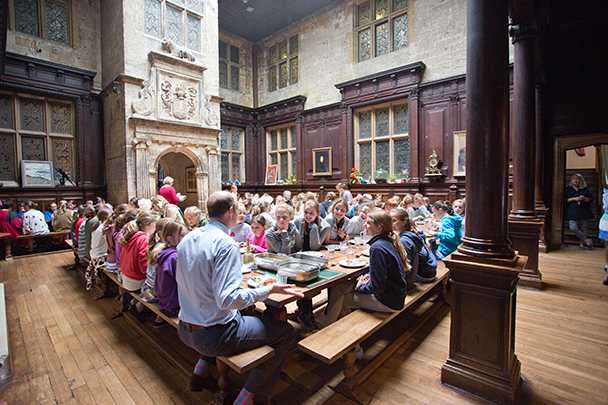 Meals are a big deal at Hanford because all the staff and girls eat the same meal cooked from scratch in the kitchens in one sitting in the stunning Jacobean Hall. Mrs J, the Headmaster’s wife, works out a seating plan to ensure that girls of all ages mix together exactly as you would in a family setting. Our kitchen staff source most of the meat and dairy from local suppliers including Else Family Butchers in Stalbridge. Our eggs come from Foots in Bishops Caundle while Longmans Dairy in Somerset provide the butter, cheese and whole milk. There is not a set menu at Hanford as the cooks chose to take inspiration from the garden and other seasonal produce. There are however some firm favourites with the girls. Highlights include fish on Friday, Banoffee Pie, Dauphinoise Potatoes, Sunday Lunch and Spaghetti Bolognese. The most important meal if you could call it that of the day as far as the girls are concerned is ‘Milk and Buns’ at around 4pm o’clock when they are given home-baked goodies washed down with a drink. 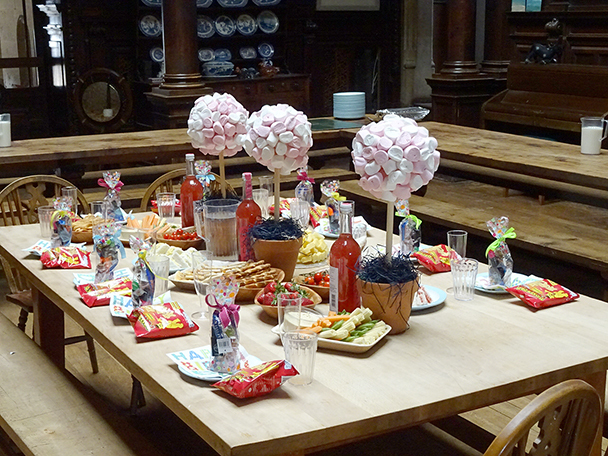 Girls love having a birthday during term time as they can have tea in the Hall. In their last year those girls whose birthdays have always been in the holidays are able to have an ‘unbirthday’ tea on a day of their choice. Parents can also bring cakes and treats to celebrate their daughter’s birthday at Hanford. If however they are unable to bring food, the kitchen produces some amazing birthday cakes and party fare. Their creations range from the whimsical to the fantastical and bring a smile to everyone’s faces. The birthday girl will celebrate with her form and any siblings are welcome to join in the fun. They count down from their age to zero and then sing Happy Birthday at full volume.